Gweek Players were founded in 1984 – our first production was ‘Breath of Spring’ by Peter Coke. Since then we have performed 2 plays most years (April and November), usually comedies but plenty of serious stuff too – ‘They Came To A City’ by J B Priestley; ‘Pack of Lies’ by Whitemore and more recently Alan Bennett’s ‘Talking Heads’. Comedies have ranged from Priestley’s ‘When We Are Married; Neil Simon’s ‘The Odd Couple’; Noel Coward’s ‘Blithe Spirit’ and Peter Quilter’s ‘Glorious’. The importance of being Earnest was first performed on 14th February 1895 at the St James Theatre in London. It’s a farcical comedy in which the protagonists invent fictitious friends or relations in order to escape burdensome social obligations. Total Sell out and huge success! Or in fact 17 to 21 as due to demand we had to add another date! All over and done with – even the props have gone back to their right homes! We all really enjoyed the play last night . Last nights production was really funny but very poignant . Enjoy the rest of the production, have a piece of Apricot Tart, always a treat ! Just to say how much we enjoyed last night’s performance. It was a roller coaster ride of emotions, one moment laughter, the next close to tears. The sets were amazing as usual, should the stage movers have taken a bow as well? It was a very professional and polished performance and the front of house members were great. The chocolate mousse and lemon cheesecake, delicious. We look forward to November. Just back from tonights performance, absolutely fabulous, well done. Well done to all for a wonderful performance, greatly enjoyed by all. Excellent evening’s entertainment in Gweek, ladies, hope you enjoyed it as much as we did. Congratulations to all concerned, including the creator of the Apricot Tart – delicious! As first timers to your productions can I say how much we enjoyed our evening yesterday. It was great having a table and we thought the play was excellent. The pud was good too! We will be coming again. Think you all did very well – great play (and the legs weren’t bad either!). I just wanted to say how much ….. (we) …enjoyed The Cemetery Club – for me, even better on 2nd watching! It was superbly acted by all of you and in the end a very moving experience. Thank you, and well done! The Cemetery Club is a funny and heart-warming play. Three New York widows meet once a month for tea before going to visit their husband’s graves. Ida is sweet-tempered and ready to begin a new life, Lucille is the life and soul of the party, but Doris is priggish and judgmental, particularly when Sam the butcher appears on the scene. He meets the widows while visiting his wife’s grave. Doris and Lucille scheme to squash the budding romance between Sam and Ida but are guilt-ridden when this nearly breaks Ida’s heart. Gweek Players latest production of ‘On Golden Pond’ by Ernest Thompson was a financial and artistic success. This is a delightful play – almost better then the film. Funny, witty and charged with poignancy. Norman is an irascible 79 year old with the beginnings of dementia, Ethel his wife adores and is exasperated by him in equal measure. Their daughter , Chelsea, who has a problematic relationship with both her parents but particularly with her father, arrives with her new boyfriend, Bill, and his 13 year old son, Billy. The young boy changes the old people’s lives and recharges their energy for living – teaching them some interesting vocabulary at the same time! As a cast we loved doing this play as it had good writing, depth and humour. 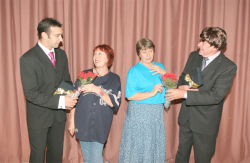 The audiences were very appreciative and we got excellent feedback – even from CDA who later nominated Sandy Tyndale-Biscoe for Best Actor. Gweek Players celebrated our 30th anniversary with a world premiere! 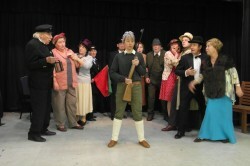 A specially written comedy drama “The Ghost Express” was performed 28 to 31 May 2014. The play was a complete sell out and was much enjoyed by our audiences. The plot told the story of a group of railway passengers who find themselves stranded in an abandoned station during the Second World War who are fighting for their lives and the future of their country.. It’s a story about relationships, duty, loyalty and how far people will go to defend what they love. It is a drama but also a comedy! The village hall in Gweek was transformed. The clock was wound back, and when the audience walked through the door, they found themselves back in 1943. It was an amazing group effort, with the backstage crew working all hours to create the illusion. Pygmalion is going to be a great production and fortunately I am much better at directing then websites! However you may now use the website to order tickets and it works!! 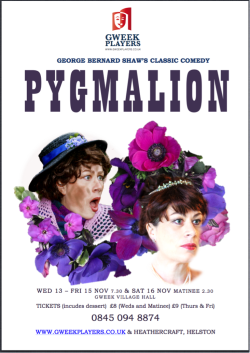 George Bernard Shaw’s much loved comedy Pygmalion was the basis for My Fair Lady. Professor Higgins decides to teach Eliza, a flower girl, to speak like a Duchess and to shape her into the sort of woman he wants – but Eliza has ideas of her own! Served with our popular dessert in the interval the play will be a feast of fun. Please note that we are doing a matinee this year on Saturday afternoon – a new idea to see if it is what you, the audience, like. Join us for an evening of mystery and detective work!! We are holding another of our popular mystery murder evenings with pasty supper and pudding. You will watch scenes (specially written for us) that lead up to a murder. Then you will have to use your detective skills to work out whodunit! Prizes for the best answer. Come to this riotous comedy and have a great evening. All the usual ingredients of a great Gweek show – great play, great acting and great desserts! Get your Wind in the Willows Tickets here!! Toad, Rat, Mole and Badger’s adventures are well known and loved. In this delightful and funny adaptation by Alan Bennett, both adults and children will be enchanted. Served up with our delicious puddings in the interval, this will be an evening of delight for all ages. Noel Cowards’ brilliant. witty play Private Lives was a huge success! “Private Lives”, thought by many to be the greatest comedy ever written, premiered in London in 1930 and has been produced around the world ever since. The plot resembles that of a tragedy, but Coward fashions from it a fast-paced story, moving from misfortune to full-blown absurdity. Prone to cynicism and irreverence, Coward’s glamorous upper-class characters seem incapable of taking much of anything seriously for long – a condition which usually proves contagious for the audience as well. He firmly believed the theatre existed for people’s amusement, not to teach or reform. Glamorous, rich and reckless, Amanda and Elyot have been divorced from each other for five years. Now both are honeymooning in a French resort with their new spouses. When, by chance, they meet again across adjoining hotel balconies, their insatiable feelings for each other are immediately rekindled. They hurl themselves headlong into love and lust (the second act love scene was nearly censored in Britain) without a care for scandal, new partners or memories of what drove them apart in the first place. In the past the play has attracted such names as Laurence Olivier, Richard Burton, Elizabeth Taylor, Maggie Smith and John Gielgud. 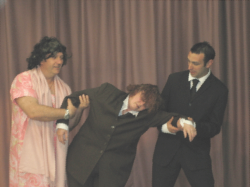 The Gweek Players’ production, directed by the irrepressible Guy Watson, will star Michelle Dickson as Amanda, Sandy Pulfrey as Sibyl, James Care as Elyot and Alan Perry as Victor. 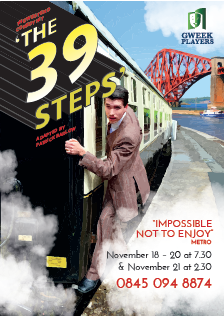 The cast and enthusiastic backup crew aim to recreate the ambience of the 1930’s in Gweek Village Hall. The stage and auditorium will become an exquisite French Art Deco Hotel with a pianist playing the music of the era. “Private Lives” will open on April 18th for three nights only. Performances at Gweek Village Hall. For tickets – £8.00 including a delicious dessert – call 0845 0948874 or from Heathercraft, Helston. 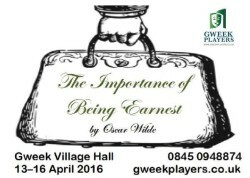 In the 28 years since the group was founded, Gweek Players have offered Cornwall two plays per year, usually in April and November. Comedies have been the mainstay of the repertoire – they know how much their audiences enjoy a good laugh – but straight plays, thrillers, mysteries, even the occasional classic, have all been included. Over the years they have established a reputation for putting on high quality, professional-standard shows, and intend to continue doing so for many years to come. In modern English this is a great way to revisit or get to know a classic of English Literature. It is a bit naughty so we are not recommending it to under 12s! Think medieval saucy seaside postcard! or Heathercraft, Coinage Hall, Helston. Why are we Fund Raising? We are raising money to buy our own set of ‘RAISERS’ – the staging that raises the audience up so that you have had such a good view! We have been hiring from another drama group and as they have now put their prices up we have decided that it is time to buy our own set which will be of benefit to everyone who uses the hall. Some members of the Gweek Players have kindly agreed to advance the Players £2,400 interest free so that we can buy a set now but they need paying back as soon as possible! Reg has invited his pompous boss to dinner; his wife, Geraldine, feels that their marriage is getting dull and is ripe for mischief. Their daughter, Billie, wants to marry the boss’s son. No-one is prepared for Geraldine’s decision to liven things up by impersonating Reg’s imaginary brother Rollo. Reg retaliates by dressing up as Rollo’s eccentric wife Lilian. When domineering Granny returns unexpectedly the scene is set for a great deal of comic misunderstanding. This comedy is a rebel’s fantasy; a hostess’s nightmare and an hilarious treat for the audience.